The Series TX motor is Foredom's most powerful flex shaft machine at a full 1/3 HP. TX has a permanent magnet DC motor that features the latest in flex shaft technology. This ball bearing model utilizes advanced rare earth magnets (in place of the wound fields in Foredom's universal Series SR motor) that deliver more torque at the low end and throughout the entire speed range of 500 to 15,000 RPM. No other flex shaft gives you greater control of the cutting tool, drill, or bur under any load. Made in USA. Includes 39" flex shaft. Speed range: 0-15,000rpm. 50/60Hz. 115V. Foot Rheostat sold separately. TXR rheostat is shown but not included. The TX motor also accepts the SXR-1 foot rheostat or the EMX manual speed controller. Backed by a two-year manufacturer's warranty. 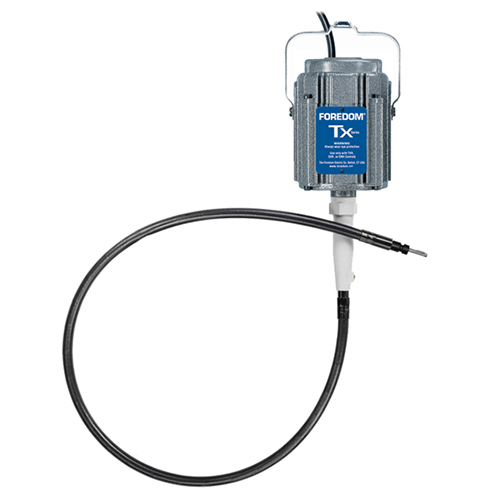 Also available in a money-saving kit which includes handpiece and speed control: Foredom TX Kit.